Butted Tube Performance — Fairing Industrial Inc.
Butted tubing are advantageous for structural applications where lightweight performance is wanted. This tube technology focuses to reduce weight and allocate strength needs -plus additional benefits of compliance. As oppose to round plaingauge tubes which have a consistent wall thickness throughout its length, butted tubes have variable wall thicknesses. The most common type is "double-butted" tubing, which is possible for all of our stock alloy materials. 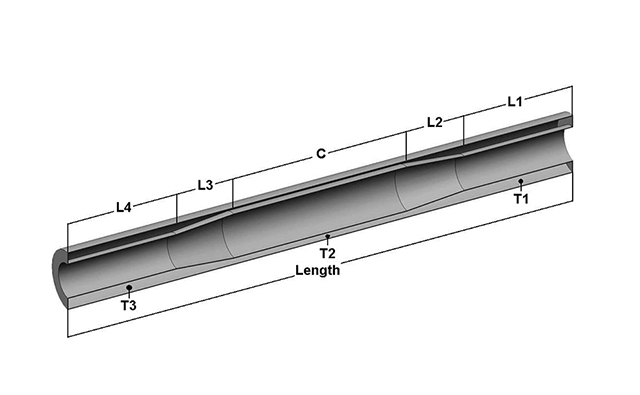 These particular tubes have thicker walls at each end for strength purposes at joints. The mid-section is thinner for weight savings but also help dissipate stress arising from the heavier ends or butts. Our tubes are drawn over an internal mandrel (DOM) for better tolerances and mechanical properties. We offer a variety of butting configurations as shown in these exaggerated examples below, and we also do services for custom butting profiles up to 1-meter tube lengths. Contact us for questions or inquires regarding butted tubes.